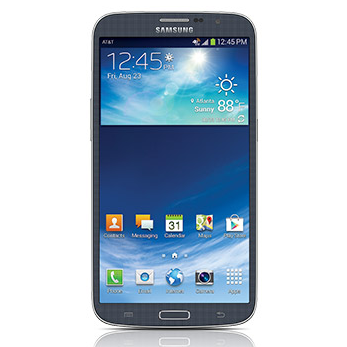 AT&T just launched a large amount of phones all at once, but none are so large as Samsung's Galaxy Mega 6.3. This relatively low-priced alternative to the Galaxy Note and Optimus G Pro is the largest phone in AT&T's lineup, and at the moment, also the largest carrier phone anywhere in America. The device is available now at $149.99 on-contract or $479.99 unsubsidized. The Mega 6.3 naturally has a 6.3-inch display, but it's an LCD panel instead of Samsung's usual AMOLED, and the resolution is a mere 1280x720. Inch for inch, that's very low compared to flagships from Samsung, HTC, and LG. The Mega also lacks the Wacom digitizer and stylus of the Note family. Inside is a dual-core Snapdragon S4 Pro CPU running at 1.7Ghz, 1.5GB of RAM, 16GB of storage (plus a MicroSD card slot), an 8MP rear camera, and a huge 3200mAh battery. You'll need every last milliamp with that screen and an LTE connection. The software is Android 4.2 with Samsung's usual TouchWiz accoutrements. At half the on-contract cost of Samsung's own Galaxy Note II, the Mega makes sense if you want a huge screen and don't really care about the rest of the phone. Not that these specs are bad, they're just decidedly mid-range - and that's what you're paying for. Those who want a huge screen and tip-top silicon should wait for the upcoming Note III. At the moment, the Galaxy Mega 6.3 is available only in blue. The web store is stocked (with free shipping), and at least some AT&T retail locations should be ready to sell it in the morning.